The Granite Gear Vapor Trail was the most popular backpack on the Appalachian Trail 15 years ago. This reproduction is nearly identical to the original, warts and all. 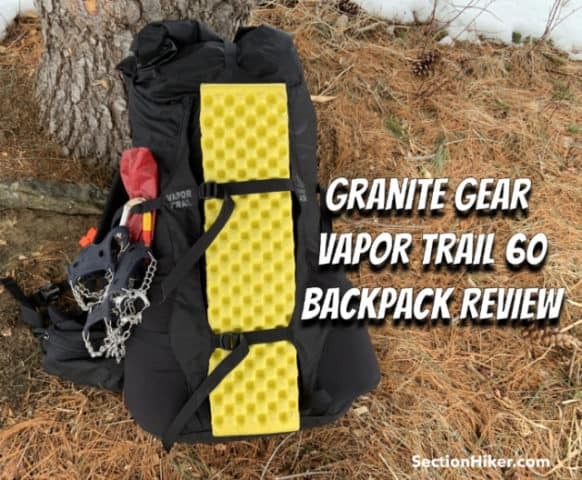 The Granite Gear Vapor Trail 60 is a remake of a vintage ultralight-style backpack that was retired about ten years ago and is no longer made. At one time, the Vapor Trail was the most popular backpack used by thru-hikers on the Appalachian Trail. REI decided to reissue it as a member exclusive and contracted Granite Gear to bring it back, close to its original design. I had high hopes for this reissued Vapor Trail 60, but it falls short of the design improvements that Granite Gear has made to their backpacks in the intervening years. I suppose it would make a great gift for a relative who hiked the Appalachian Trail with it back in the day, but for $50 more you can get a new Granite Gear pack that overcomes the Vapor Trail’s deficiencies. . The Granite Gear Vapor Trail is configured like an ultralight style backpack with one notable exception. While the pack has two side water bottle pockets, it does not have a front stretch pocket for stashing layers or snacks. There are two compression straps across that area of the pack so you can lash a pad or tent there, but no pocket. That’s a deal killer for me right there….If you’ve gotten used to having a front pocket on a pack, it’s hard to use a pack that doesn’t have one. The Vapor Trail 60 has two side pockets, both made with a high density stretch mesh. While they’re quite large and can hold two 1L Smartwater bottles each, they’re not reinforced on the bottom with solid fabric and therefore susceptible to abrasion. There’s also a side compression strap that runs over the pockets, but not through it, making it difficult to compress the pack and pull out a water bottle at the same time. If the compression strap isn’t tight, I can reach back and pull out or replace a bottle on the Vapor Trail 60, but I’m fairly flexible that way. Your mileage may vary. The main pack bag has a long extension collar that closes with a drawstring. Once you’ve packed, you roll up the excess capacity and lash it down with two webbing straps, one that runs front to back and one from side-to-side over the top. Can those long webbing straps hold a bear canister? It’s kind of tricky. The extension collar isn’t wide enough to fit a bear canister horizontally. While you can lash the bear canister on top of the extension collar with those two long straps, it’s tricky to get it to stay in place. It’s also difficult to set up other stabilizing straps or cords to hold a canister in place, because there are no good anchor location on the front of the backpack or the sides. The top of the main pack bag extends past the top of the framesheet, so that the load lifters are anchored on the pack bag fabric without any structural support. That’s not so good because you want to pull the frame toward your back, not the slack in the pack bag. If you load the pack bag past the top of the framesheet, it has a tendency to rub against your head which is real annoying. The best way to avoid this is to really crank down on that front-to-back top strap, to pull the extension collar backwards and angle it away from you. The Vapor Trail 60 “frame” is a flexible polyethylene sheet sewn into the pack. It’s very soft and the pack is essentially frameless, which limits its load carrying ability to about 20 pounds. You can stiffen the pack by rolling up a foam pad and dumping your gear in the middle, but that’s not going to increase the effective load-to-hip weight transfer beyond 25-30 pounds. The back of the pack is heavily padded, but the framesheet is quite soft and flexible. The back of the pack is thickly padded, using the same foam and cover fabric that used on the shoulder pads and hip belt. There’s also a gap between the padding and the pack bag that makes a convenient place to store a hydration system so it’s easy to pull out and refill (or to keep your tortillas warm). The shoulder pads have daisy chains sewn on them, which makes it easy to attach accessory pockets. They are also S-shaped shape which is more comfortable for people with well-developed chests and breasts. The hip belt is the same ReFit help belt that Granite Gear puts on all of their other packs including the updated 2019 Crown2 60 and the Blaze 60. It’s an adjustable length hip belt so you can size it to fit your exact dimensions. It’s secured to the backpack using velcro and easily removable for adjustment. The hip belt has two big solid-faced pockets, each big enough to hold a large smartphone and other gear or snacks. It has pull-forward webbing straps to tighten it with beefy plastic buckles. The Vapor Trail 60 has two tiers of side compression straps and a pair of straps on the front which can be used to compress your load or lash gear onto the outside of the pack. The straps are made with 3/4″ webbing instead of the narrow 3/8″ webbing that Granite Gear uses today. The side straps are long enough to lash a pair of snowshoes to the sides of the back, while the front straps are long enough to hold an accordion-style foam pad, like the NEMO Switchback. There are also two ice axe loops on the base of the pack. The Granite Gear Vapor Trail 60 is a remake of a classic backpack that was popular about 10-15 years ago. With the exception of the hip belt, the recreated backpack is quite similar to the original, with all of its original deficiencies, including ineffective load lifters, no front stretch pocket, and antiquated water bottle pockets. While the Vapor Trail 60 is functional, Granite Gear’s current backpack designs correct all of these flaws and are better backpacks. If you like the look, volume, and weight of the Vapor Trail 60, I think you’ll like updated 2019 version of the Crown2 60 even better. It’s about $50 more, but the difference in price is totally worth it.